The Doisy-Védrines vineyard remains the largest of the three Doisy estates (Daëne, Védrines and Dubroca) with 30 hectares of vines with an average age of more than 30 years. The vineyard is dominated by Semillon, accounting for approximately 85%, the remainder being Sauvignon Blanc. 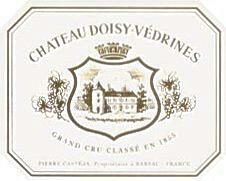 Chateau Doisy-Védrines was classified as a second growth in the 1855 classification of Bordeaux. On the nose this wine is extremely explosive and immediately pierces the senses with powerful and intoxicating aromas of apricot, honey, botrytis spice, vanilla, and just a hint of tire rubber. Ha Ha.... yeah it smells like a bike shop and fresh new rubber bike tubes! - This is very slight and blows off as the wine opens up. On the palate this wine is extremely creamy and fatty, it has a melted butter-like texture. The flavors are incredibly bright and fresh with notes of lychee, ripe tangerine, and a light touch of honey. On the finish the botrytis spice kicks in with lovely white pepper notes that are accompanied by flavors of honey, vanilla, and mineral. This wine is quite sensational and quite a bit better than the last Sauternes I reviewed just a few days back. Actually "better" is a bad word that should never be used when talking about wine...... What I mean is that I believe this wine has quite a bit more complexity and perhaps a bit more of what I find interesting and spectacular about wines from this part of the world. You see, my impressions of fabulous and near perfect Sauternes will always be burnt quite firmly into my mind. I've had about a dozen Chateau d' Yquem experiences, and with exception of maybe one, I have always been floored by the intensity and powerful flavor-burst that these wines can offer. Yes, Yquem is in a different class, but all other Sauternes and Barsac will have to be measured by that perfection. Sounds fab. I've only had dessert wine in Paris once and we've had Australian dessert wines because well, I live here and it's cheap. If I make dessert, you bring this wine, okay? I love this Sauternes and for the price point I think it provides excellent quality. I love Y'quem but unfortunately can't afford it all the time! This is a good alternative.